By completely eliminating your “window of opportunity”.... You know, that time between your baby actually going to sleep so you can practice, and them waking up. how confident you would be if you could repeat each step, until every action becomes so gentle and free flowing that you don’t disturb the baby with every movement you make! How would your client gallery look, if you could pre map your entire session flow, client focused to their individual tastes and styles but streamlined for minimal movements and less disruptions to your baby. Imagine reducing your overall shoot time but maximising your client gallery? Would images of your clients toddler turn out better if you had a chance to see what they were capable of first? If you could quickly and easily make adjustments that would put them at ease before the pressure of placing their newborn sibling in their arms? StandInBaby™ is the game changer. Changing everything from how you learn and create, to how you instruct your clients and streamline your session flow. Meet our incredibly talented StandInBaby Ambassadors from around the world. Receive instant access to our "Members Lounge". Showcasing an ever growing catalog of FREE easy to follow tutorials and videos. After graduating college in 2013, I went to work for a mall studio to help pay for the bills to help pay for grad school. It was there that my love for photographing children grew. I started my company in 2014 and it was an instant success. I currently do not have a studio, but instead travel to my client’s homes where I set up my own studio in their space. I usually use my studio lighting, but occasionally my client’s have beautiful natural light that I cannot pass up! My goals right now are to purchase a home with my husband where I can have the studio of my dreams. I have a lot of clients in New York City and with trying to start a family, that drive (1-2 hours) is just becoming too much. I would also like to start teaching workshops in the near future! 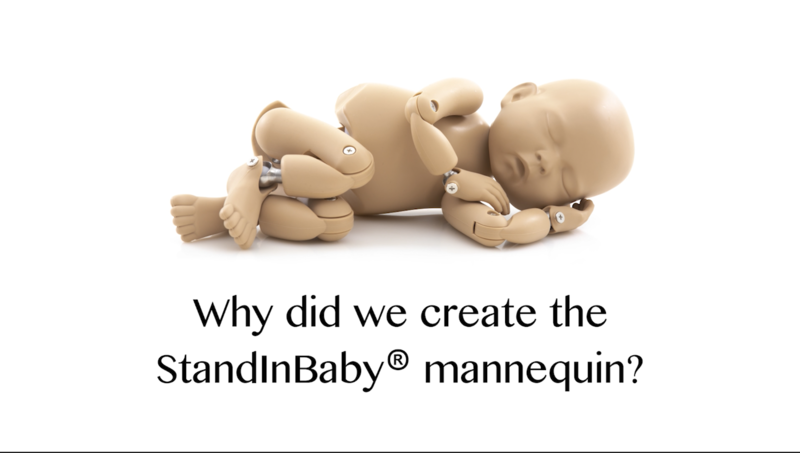 What challenges were you experiencing prior to purchasing StandInBaby? There were just some poses, wrapped and unwrapped that I was just not nailing. Within a few hours on using my SIB, I was able to figure out the correct positioning and angle baby needed to be to get it perfect. What made StandInBaby appeal to you? The most appealing thing was how life life-like it was. I would finally be able to accurately practice poses that I was having troubles with. It also gave me the opportunity to be able to teach others, which is something I have been wanting to do for a long time. How have you benefited from using StandInBaby? In the few weeks of using my SIB, I have perfected wrapping techniques I had been trying to nail for over a year, as well as coming up with new poses for my sessions. I can’t wait to bring it on location to help parents feel more comfortable with family shots as well! StandInBaby is beyond anything I was expecting. I am so thankful to the Moffatts for everything they have done to help this community! “SIB is amazing. I have held her for two minutes and immediately she felt like she was a real baby. The fluidity of her body is exact. Her measurements - precise. I believe she will revolutionize the newborn industry in regards to baby safety training and handling." Read the latest news and events from StandInBaby. We post regularly on Instagram. If you are a newborn photographer looking for some inspiration then feel free to follow our journey. Written in conjunction with healthcare professionals. First time using my babe! I’m a traveling newborn photographer, so I have my clients select props and such a PDF ~ I took this opportunity to redo my entire PDF. Only half way done! As a prop vendor and beginner photographer I invested in getting a StandinBaby. It is absolutely amazing and has given me confidence in wrapping, posing and experimenting. I did it I just ordered my Stand in baby !!!! ? I would not in a million years have thought I would be so excited/emotional about receiving a “doll” but, OMG, I almost cried and peed my pants at the same time. Check out Daisy 🙂 I wanted to try out this set up before my session tomorrow and I could!! And she is so perfect!! Oh, dear! I’m in love ❤ ❤ ❤ with many of the pictures I see in here. Those SIBs look almost real! I can’t wait to receive mine! This has been the greatest tool so far! Great for styling prop, poses. And today I used it as a demo with a Mom to show her how we were going to get her to hold the baby…. What a difference… easiest session so far! She knew exactly what to do. Mom was impressed… I’m impressed!! Haha! Anyone on the fence about getting one…. It’s a great tool! With all those images I expect a SIB posing guide in 2017.